This subproject aims at highlighting tensions in European ideals of justice and fairness from the perspective of groups who experience or are vulnerable to injustice. By accounting for the contextualised ‘lived experiences’ of (in)justice, the study brings to the fore non-hegemonic claims to justice expressed by disadvantaged groups and individuals. It rests on an assumption that the ‘lived experience’ of injustice is by no means homogeneous – how vulnerable categories experience injustice (e.g. as misrecognition of as maldistribution) may differ not only per sphere of justice (economic, social, political and civil/symbolic), but also per category of the vulnerable. After all, each of the countries involved in ETHOS has developed its own model to balance and incorporate interests of various groups of the population (the young, the old, women, ethnic and religious minorities, recent migrants and asylum seekers) and to define and deal with the ‘insiders-outsider’ divide. While the study takes the perspective of the vulnerable, it avoids a focus on victimhood, emphasising agency. The project promotes debate and discussion among those experiencing injustice and the broader public, about the challenges and opportunities that their experiences pose for Europe. 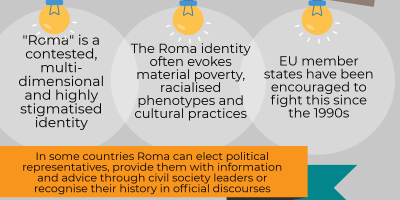 This report examines the relationship between political representation and experiences of (mis)recognition by reflecting on the results of six national case studies on the Roma. It inscribes itself within the ETHOS strand of research on justice as lived experience and builds on previous project deliverables on different conceptualisations of justice. 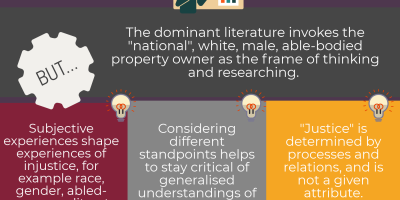 More specifically it develops insights derived from critical race theory and tries to overcome the methodological nationalism that underlies the social sciences in general and the literature on political representation in particular. 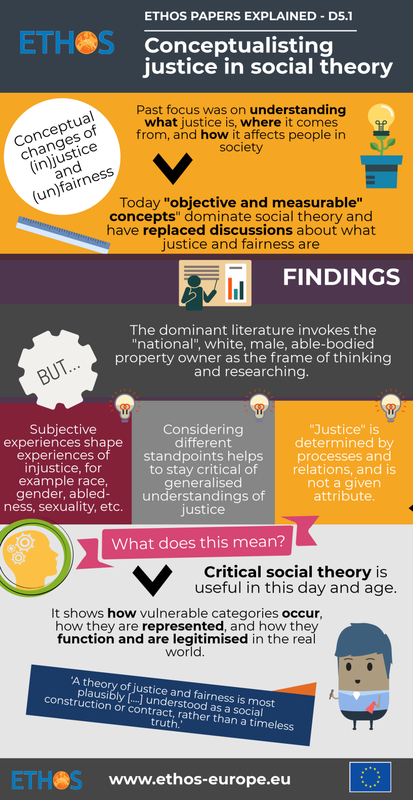 This deliverable outlines the conceptualization and articulation of justice in social theory. This deliverable will principally focus on sociological and anthropological theories that relate in one way or the other to philosophical reflections on justice and fairness. At the beginning of these disciplines’ developments, their founders were deeply interested in justice related issues, reflecting on legal, economic, social and interpersonal aspects of (in)justice and offering macro- and micro-level interpretations of causes and outcomes of (in)justice and (un) fairness.